Street signs watching for motorists using their phones are being tested in Britain. Big Brother anyone? Distracted driving is a major source of accidents. In hopes of combatting the problem, road signs that can detect whether a cell phone is in use are being tested in the UK. 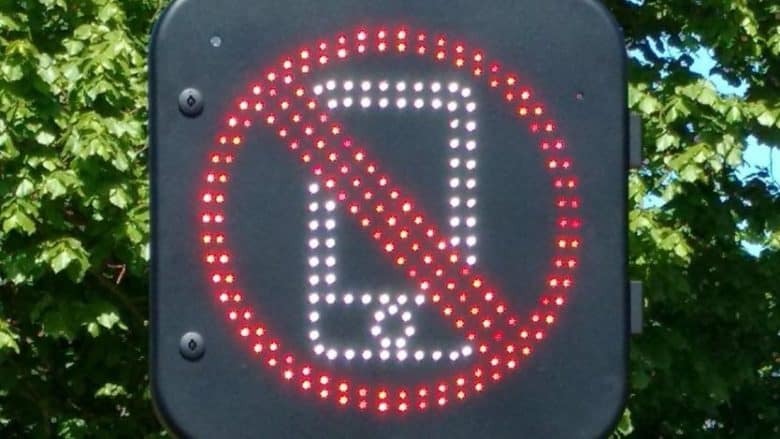 The signs currently just light up to remind the motorist to put down their phone. Plans to record the license plates of drivers receiving warnings are being considered. And traffic citations are the likely next step. Britain isn’t alone in this effort. Australia is exploring using cameras to ticket motorists who are on their cell phones while driving. “RoboCop” machines that can give traffic tickets to motorists are controversial. They smack of Big Brother, a policeman who is always watching and can’t be argued with. And setups designed to tell if someone is using their phone while behind the wheel face even greater pushback from the public because they are new and untried. The system being tested in Australia uses cameras to detect if a driver is holding their phone. The UK method is different. The sign points an antenna at the road and lights up if it detects a phone transmitting to a cell tower. It can tell if Bluetooth is also being used, telling it to not activate. This is a problem in the U.S., too. Failure to pay attention behind the wheel killed 3,450 Americans in 2016, according to the National Highway Traffic Safety Administration. During daylight hours, approximately 481,000 drivers are using their phone while driving. Almost anything that helps prevent this epidemic of accidents is worth exploring.